By 2020, approximately 53% of open jobs in Louisiana will require a career credential or college degree according to the Georgetown University Center on Education and Workforce. It will take a comprehensive approach to address the challenges the State faces in meeting this expectation. 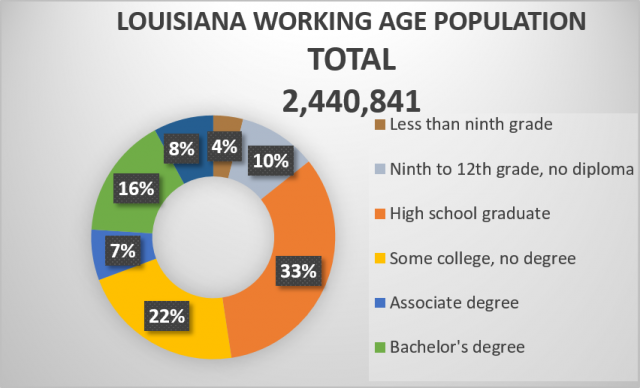 Filling these college-trained jobs will prove challenging to Louisiana’s under-educated adult population. The Lumina Foundation maintains that other post secondary credentials — including certificates and certifications — should count toward national and state goals for attainment, with one important caveat: they should be of high quality, defined as having clear and transparent learning outcomes leading to further education and employment. A 2016 Lumina study estimates that Louisiana’s post secondary attainment was 44.7%, including high-quality certifications. Lumina acknowledges that Louisiana’s estimated certificate-attainment percentage may be overstated and needs further refinement. Louisiana looks forward to future work by Lumina in this regard. Overall, whether NCHEMS or Lumina estimates are used, the State’s educational attainment projections still fall short of reaching the recommended rate by 2025 of producing sufficient individuals to fill the openings of good jobs in Louisiana. Essentially, 15% of good jobs (high demand and well paying) that will become available each year will require no formal education beyond a high school diploma or equivalency. Slightly more than half of the good jobs across Louisiana today and those that will become available each year require a community or technical college degree or other credential. Slightly more than 30% of good jobs in Louisiana requires a bachelor’s degree or higher. Postsecondary education must provide a highly skilled and well-trained workforce for Louisiana’s existing businesses and equip the State with the human capital needed to attract new business and industry. Secondary and postsecondary education leaders must partner to strengthen the connections between the senior year of high school and the freshman year of college. Postsecondary leaders must advance strategies that minimize college seat-time to degree completion, and there must be an expectation that collaborative postsecondary education and business and industry public/private partnership efforts are necessary. A quality postsecondary education experience should be available, accessible and affordable to all the citizens of the State, from the recent high school graduate to the adult returning to receive training or a credential.